Tamil version of a Chinese Opera from Peking, The Red Lantern, was staged by Veruveli Drama Group of the Fine-Arts Department of the Arts Faculty of University of Jaffna Saturday. The theme of the drama centered around a Chinese activist family that contributed to preserving and sustaining the Chinese struggle through three generations of Japanese occupation. The Tamil version of the Drama launched at the Kaliasapathy Auditorium was organized by Mr. Kulanthai M. Shanmugalingam, Director of the Arts and Dramatology Institute (private). Kulanthai is a lecturer in Dramatology and has earlier authored popular plays like "Mann sumantha meniyar" (Those who shouldered the burden) - one of the most influential dramas in the Tamil struggle staged in mid 1980s. The 90 minutes long Tamil version of the Red Lantern was directed by Mr. K. Rathitharan. The Red Lantern was orignially staged in China during early 1970s. Mr. Kulanthai said that the students have never seen a Peking Opera, but were shown some of the pictures from a Chinese book. 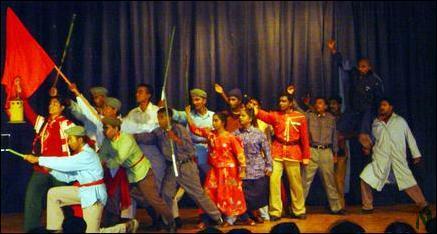 The Tamil rendering of the play was also carried out by the team itself, he said. The drama team deserve credit for their skill in bringing out forcefully the emotional content of the play, said drama enthusiasts who attended the event.